Continuing upstream along the Cosumnes River, the next bridge across the river carries State Route 49. I was able to get a few photos as the sun was setting. We can see the bridge is a continuous three span cast-in-place box girder bridge on tall piers. The main span is 33.5 meters long and the bridge was built in 1955. 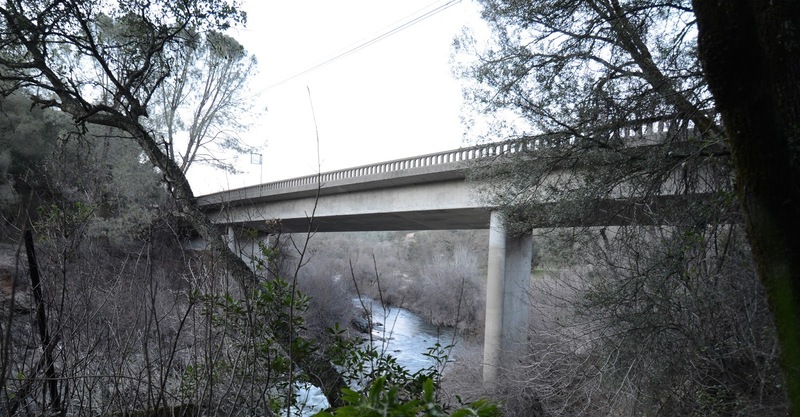 Yesterday's Latrobe Bridge was a local agency bridge that was built in 1959, so I assume southwest El Dorado County must have been getting sorely needed infrastructure in the 1950s. The Cosumnes River marks the north/south border between Amador and El Dorado Counties in the west. Just east of this bridge the Cosumnes splits into several forks. El Dorado County, California Bridges: SR 49 Bridge across the Cosumnes River by Mark Yashinsky is licensed under a Creative Commons Attribution-NonCommercial-ShareAlike 3.0 United States License.